This entry was posted in Substance Abuse and tagged Addiction, Pain Medication, Prescription Medication, Signs and Symptoms on September 12, 2016 by Team Addiction Hope. For people suffering from severe pain, methadone may be a solution. This powerful analgesic medication is also used in some situations as a replacement drug for people who are recovering from addiction to other (more harmful) painkillers. 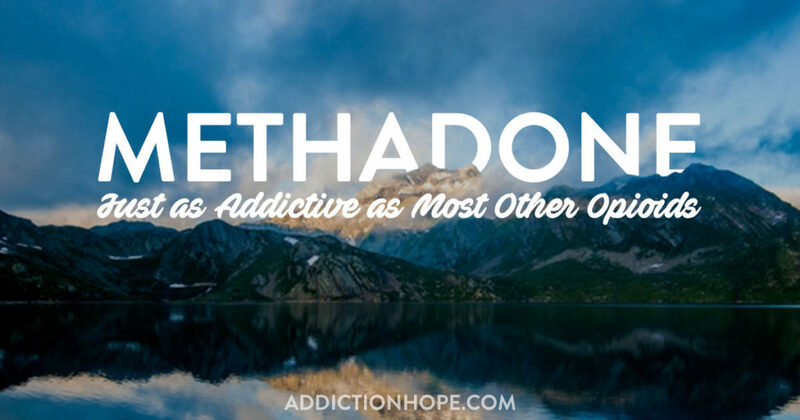 Methadone is an incredibly addictive opioid. Even prescription levels of methadone can be habit forming, and taking excess levels of this drug can severely increase the risk of addiction and overdose. Patients who are given methadone to help treat withdrawal symptoms must take the drug as prescribed and not share the medication with anyone else. Patients with methadone pills or liquid left over after treatment should ask a pharmacist about a drug take-back program to dispose of the substance. If no such program exists in the area, methadone can be safely flushed down the toilet. Missing a dose of methadone is not uncommon, but it must be handled correctly. A patient should never take more than prescribed in an attempt to make up for a missed dose. If the methadone is taken for pain, the patient should take the dose as soon as possible and then wait the recommended amount of time before taking the next. Those taking methadone as part of an addiction-recovery attempt must simply wait and take the next scheduled dose. These patients should not deviate from the normal schedule. Learn even more about methadone by clicking here. The volume of methadone addictions is on the rise. Methadone is a relatively inexpensive drug compared to other opioids, which makes it easier to access. Because it is inexpensive, some doctors often prescribe it to patients to treat minor aches and pains. Since methadone is used as a replacement treatment for patients recovering from addiction to more powerful opioids, the patient is at risk of trading one addiction for another if he or she does not stick to the exact treatment plan. Battling addiction to methadone is difficult, but withdrawal from the drug can be painful, frightening and often discouraging. The pain associated with methadone withdrawal is often severe enough that it drives addicts to take more than prescribed to ease the aches. Then, when the pain has passed, users again attempt to get off the drug, leading to a cycle of withdrawal, pain and drug use. Complications of methadone withdrawal are few, but there is one serious risk: dehydration. Anyone who experiences nausea, vomiting and diarrhea can easily become dehydrated and may be too distracted by the other symptoms to realize the danger. A person addicted to methadone usually begins to feel withdrawal symptoms about 30 hours after the last dose. The amount of time withdrawal symptoms last varies from person to person, but it can be as long as several weeks. Symptoms are usually at their worst during the first week after an addict stops taking the drug. Medical experts recommend that patients should not go through the withdrawal process alone. Family and friends can provide much-needed support, but a doctor can provide treatment specially targeted to lessen the symptoms of withdrawal. Such treatment increases the odds of a patient successfully recovering from addiction and surviving withdrawal from the drug. Buprenorphine and clonidine can be given to a methadone user to shorten the length of withdrawal and to alleviate certain symptoms. In some cases, doctors may even prescribe methadone to a methadone addict. This seems contrary, but guided treatment that gradually decreases the dosage can be an effective method of overcoming addiction. There are high risks of abuse and overdose associated with this kind of methadone tapering treatment, however. Only patients enrolled in government-approved treatment programs qualify for this procedure. A physician monitors the patient’s levels of methadone and their response to the drug throughout the process to ensure compliance with the treatment program. Methadone is one of the worst drugs in terms of withdrawal symptoms and length. However, with professional medical treatment, recovery is possible.